This is one of the most searched and common question in guitar world. Every Beginner wants to play his favorite songs without losing tempo and stopping in between. I know how it feels when you start playing guitar, When i started playing guitar it seemed impossible for me to play my favorite solos or songs. I used to watch Tutorial videos and search on google etc... But nothing seemed to work for me, My fingers were not that fast to play desired songs. One thing i'll say now is Practice, Practice and more Practice will make you achieve the skill. Now from my experience I'll help beginners to achieve what they think is impossible. First thing before you start, Stop watching videos of cool solos, Stop practicing Songs with difficult intro, solo etc. Stop everything, don't even think about it. I have made some Rules which I think are important to reach that level. Don't worry you'll be playing that song with ease after some time (maybe months). You cannot play solos until you know your basics like hammer ons, pull offs, Bends, Slides, Tapping, Shredding, vibrato, scales etc. You'll have to master them to play your solo without mistakes and unwanted stops which will embarrass you if you're playing in front of friends, family, people or crowd. That will Destroy your confidence. Timing is very important when playing songs, wrong timing will ruin it all. So after getting your basics, practice timing by playing along songs. This is the most important rule of the above and the only rule which starts from the Day 1 you start learning guitar. Without this rule the above rules are difficult to achieve. you can't be a guitarist overnight, it takes time, months, even years. So Patience is very important. I guess you'll be thinking that In starting of this post, I said you have to Practice, Practice and Practice and Now i am over my own words. Yes, you've heard it right Practice makes it Prefect but Over Practice makes the Boat Sink. Don't give in long hours of practice. If you're a beginner than don't practice more than 90 minutes, Rest your fingers and don't take pressure if you're not getting it, you'll get it with time. Everyday play some chords, scales slowly, Don't Try to go fast because it will bring a bad habit in you, let your fingers learn the shape of chord, once your fingers got it then you don't even have to think about changing chords, your fingers will automatically change the shape. I am telling this from my experience. Though, It looks cool when you play standing, but its a bad idea (at least for me), especially if you are playing acoustic guitar. I am not saying don't play while standing, if you feel comfortable playing standing then go for it, but if you're having problems playing chords etc standing then i'll suggest get a stool. It's good to learn seated first and once your skills improve get a guitar belt and try playing while standing. if you are a n electric guitar player then practice at least 45 minutes standing once a week, this will help you get more comfortable while playing guitar on your feet. Well, i don't suggest this to an Acoustic guitar player because acoustic guitar is a bit bulky as compared to electric guitar, but if still you want to play on your feet then its Ok it won't harm but it can hinder your progress rate. If you love to Listen Rock, Metal, Punk etc. or follow bands like Guns 'n' Roses, Metallica, Nirvana, The Eagles, Green day, Linkin park etc... Then you may have noticed that guitarists of bands like above have long belts, they hang their guitar about waist length. It looks cool, But i won't suggest you to do that. Because, The longer the belt, the far you have to bend, the harder to play. Its not good for your back neither for your skill. Start with short belt length, In my dictionary the ideal belt length for beginners is where they can play with ease, movements should be smooth and you should not suppose to lift guitar, it should feel like you are seated. You may think its so uncool, but this uncool behavior will become a path of your success. This will help you master guitar, as you progress keep increasing guitar strap belt length. 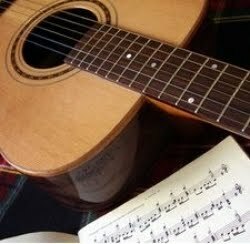 Practice chords first then move on to songs and solos. Click here for Guitar chords chart.